This is another unusual handkerchief – it has a sailing or nautical theme! 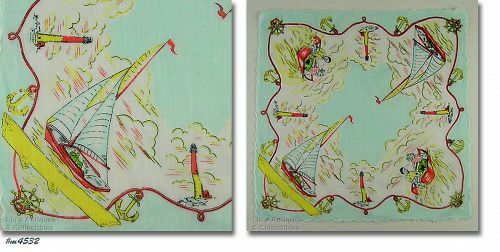 Shown on hanky are sailboats, anchors, lighthouses, a couple in a motor boat, etc. Hanky is in excellent condition and measures 12 ¼” x 12 ½”. These little Shawnee planters are difficult to find! 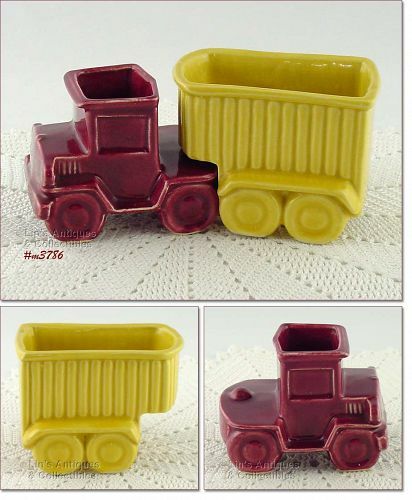 The truck planter measures 3 ½” tall (at tallest), 4 3/8” long (at longest), and 3 1/16” wide (at widest). Bottom is marked 680, Shawnee, USA. 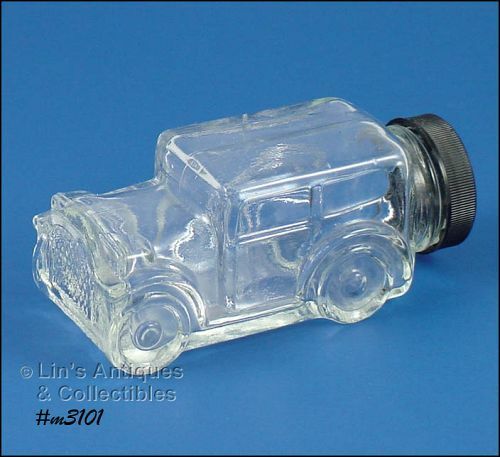 This is a neat glass candy container! It’s shaped like a car and has a “license plate” number FP1929. Car is in super condition – there’s a teeny ding above rear window – that’s it! Cute item. This is a very colorful Shawnee caboose planter -- it's pumpkin color! Planter is marked USA, 553 and is in wonderful condition. It has no chips, no dings, no cracks, no crazing! It has been used as a planter and has a small amount of mineral scaling that is not detrimental in any way! These vintage railroad forms are in the original plastic wrapper! 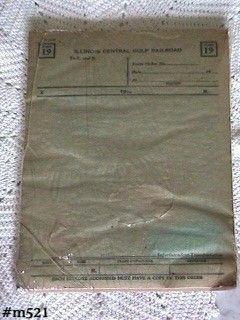 There is a date at top of form -- FC 11-47 and form reads: "Illinois Central Gulf Railroad, Form 19, To C. and E., Train Order No." etc. Bottom shows headings: "MADE., TIME, TRAIN DISPTCHER, OPERATOR" with boxes underneath each heading to be filled in. Below that "EACH EMPLOYEE ADDRESSED MUST HAVE A COPY OF THIS ORDER."